Today’s airliners are among the most connected machines in the world. Boeing expects the amount of airplane data generated annually to increase from about seven terabytes in 2010 to one petabyte by 2030. Airlines and ground handling operations must be prepared to collect, analyze and leverage the data produced by these flying data centers. The airline industry is already using predictive analytics to increase efficiency in maintenance, improve safety and fuel performance, manage maintenance records and reduce operating costs. Mobile devices have made a splash in the passenger cabin and cockpit, improving the customer experience and helping pilots do their jobs better. With advances in airline IT infrastructure, these devices are now working their way into below-the-wing applications to boost ground operations of all types. Widely available connectivity and mobile technologies are helping airline IT connect with all aspects of airline ground crew performance. 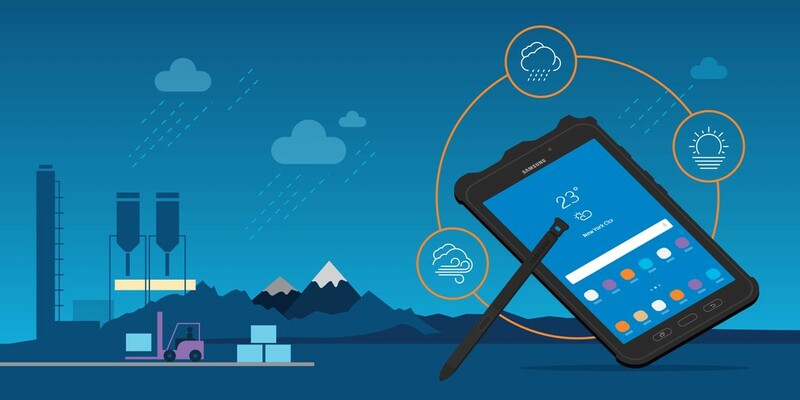 Samsung devices such as the ruggedized Galaxy Tab Active2, Samsung Gear S3 smartwatch and the Note9 can boost airline ground crew performance. And with the turn time for a flight sometimes as brief as 25 minutes, there isn’t a second to spare. Mobile devices paired with ground operations solutions can manage vehicle dispatch and management, emergency services, equipment maintenance and just-in-time aircrew transportation. Motorized and non-motorized equipment can be tracked and monitored using positioning technologies and can accurately locate equipment inside covered areas to prevent theft and unauthorized movements, while simultaneously improving utilization and planning. Ground service crews use mobile phones or rugged tablets to communicate more efficiently with real-time updates and capture and report equipment defects. The reports can be combined with images and video clips to give the maintenance team the ability to pre-order parts and schedule downtime as needed. Using data gathered from mobile devices and sensors, ground-crew service teams can track equipment maintenance reports, order parts and equipment, and monitor inventory status of parts to provide a highly detailed real-time overview, helping to maintain service levels and manage costs. Technology is under development that will track passengers’ whereabouts in the terminal via their smartphone as they pass through check-in, security, shopping areas and the gate, reports Low Cost & Regional Airline Business. If the system finds the person is not at the gate at boarding time, then ramp staff will be alerted not to load the person’s baggage on the flight. That saves a last-minute scramble in the baggage hold that could delay departure. As airlines target inefficiencies in maintenance, repair and overhaul (MRO) activities, mobile devices are speeding up operations. Mobile devices give mechanics and engineers on-the-spot access to technical manuals, work cards and e-signatures. Using these tools tightens up the workflow and reduces downtime for each aircraft. Electronic documents can be set up to require positive confirmation that a task is complete before moving on to the next step or closing the job. The quality of maintenance records is improved, and those records can be shared digitally throughout the organization. The FAA is encouraging operators to share maintenance data proactively to help develop predictive analytics to address efficiency and safety, Boeing reported. With the ability to predict maintenance events and connect with maintenance operations during flight, airlines can minimize flight disruptions, reducing the system-wide impact of delays and cancellations. The systems integrate with enterprise resource planners (ERPs) to provide a view of a performance dashboard and other business intelligence functions that allow managers to access information from their mobile devices at any time. Managers can have real-time access from the warehouse or hangar floor. Airlines, ground handling staff and security agents have mobile access to document verification with the Timatic Mobile app from the International Air Transport Association. The app provides access to up-to-date immigration rules and regulations and enables agents to run document checks just by scanning passenger travel documents with their mobile device. The scanned documents are crosschecked against the IATA database, and agents receive a clear decision on whether the documents are acceptable. The app provides automated document checks away from the main ticketing gates in remote areas such as bag drops, security checkpoints, boarding gates and information desks. The tool provides an accurate classification for many different travel documents in addition to ordinary passports and visas that are not normally readable using standard swipe readers. Today’s ground crew technology is revolutionizing below-the-wing operations, removing communication barriers to help airlines gain a competitive edge with each minute the aircraft is not in the air. The flow of analytics data and improved communication channels become a foundation for better safety and efficiency. Ensure your business is on the cutting edge of technology by checking out our full line of transportation solutions.